(Hauppauge, NY) Online Marketing Muscle announces the formation of a partnership with Infusionsoft to establish the first Infusionsoft Long Island User Group. This Infusionsoft User Group functions to allow users to connect with each other, to discuss using Infusionsoft and share tactics and strategies. Dean Mercado of Online Marketing Muscle will co-chair the group with Bill Harney of Keeping Current Matters. Online Marketing Muscle continues to spearhead an Infusionsoft movement on Long Island, and this group will help the company achieve their goal. “The Infusionsoft user group plans to meet the third Tuesday of each month, with June 16, 2015 being the kick-off meeting. The meeting runs from 6:30 to 8:30 p.m. and will be held at Keeping Current Matters. Visitors may find this business at 5018 Expressway Drive South, Suite 204, Ronkonkoma, NY, 11779. Anyone is welcome to attend to learn more about the program and light refreshments will be provided” Dean Mercado, spokesperson for Online Marketing Muscle, announces. 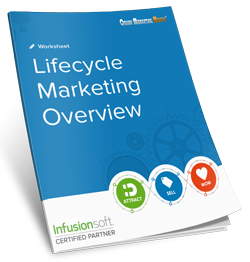 Infusionsoft works to organize a company’s contacts and turn leads into customers who love their company. The program helps a business become organized, automates the marketing process, helps to close sales and more. In addition, one finds they can keep a steady cash flow thanks to the online storefronts and payments feature of the program. “Companies find they spend less time on routine tasks and more time interacting with clients. A steady dialogue with one’s target audience has become almost essential now, thanks to the Internet and increased competition. One cannot afford to lose customers as they were busy handling routine tasks, and the program takes on these tasks, so this is never a worry,” Mercado explains. The Infusionsoft user group allows one to meet with other program users in their area to discuss strategies, techniques and tactics. Participants gather new ideas and share feedback about the program. In addition, they can exchange helpful marketing and sales tips within the group. One learns a great deal in a short period of time when they attend one or more meetings. “One obtains the best results when they make full use of the program, and nobody knows a program better than current users. With this user group, individuals find they can harness the power of the program and receive the maximum benefits, thanks to the shortcuts, hints and tips obtained in these meetings. Set aside the time to attend one or more meetings, as individuals who do so will find it is well worth the time,” Mercado promises.